Whenever I use a multiple column responsive layout, Outlook 2007/2010 seems to need more space. For example, if I have 4 columns each at 25%, in other clients all 4 columns fit = 100% but in Outlook 07/10 only 3 columns will fit. I'm pretty sure there is a bit of a tidier way to do all this but I need to do some more testing on in first. I used this solution. However, I left out 'transparent'. Thanks for the reply! Do you know if there's a solution though if we're using IMAGES like in the example I posted? I want the images to be touching each other but in all the solutions listed it seems there needs to be a chameleon-border that's inserted.. Here's my attempt to re-create what you're wanting. To add to my initial post: For my example I did a simple table with 4 tds, I specified on the container table to remove any border or cell padding/spacing. The images I set to 100% for responsive purposes. I added a <br/> to push the text to the next line and I wrapped the text in a table and set the width to 92% and centered it to give it the padding you had in your mockup. I use the same fix mentioned in the Email on Acid article (with some tweaks). Then, reduce the width of your tables by 2 (i.e. 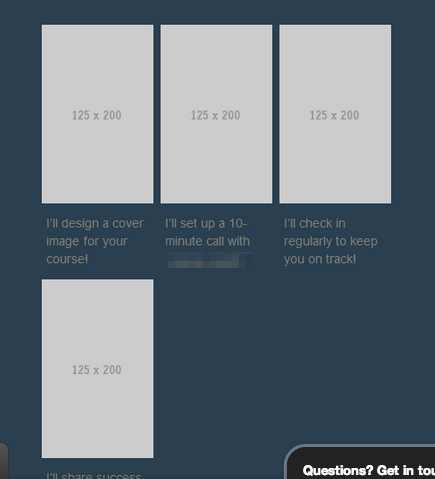 from 400 to 398) and then add a 1px border (technically only needs a border-left and border-right) to make up the width. 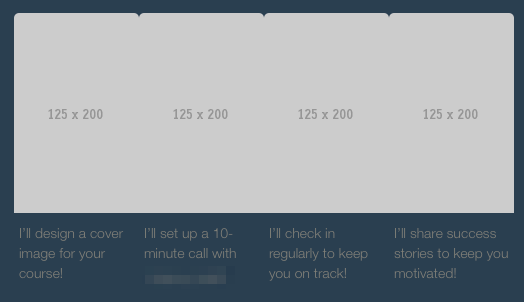 I would use fixed widths for your tables and then apply percentage widths for mobile in your media queries. This is the only predictable way of doing it. Otherwise, without that workaround, you can reduce your width (px or %) a little bit (i.e. from 25% to 23% or 400 to 393) until it 'fits' but your widths don't end up being balanced/well-aligned. Note that you only need to use this hack if you are aligning your tables (unaligned tables are unaffected). It's a really weird Outlook workaround but works every time for me. Thanks for the reply! Do you know if there's a solution though if we're using IMAGES like in the example I posted? I want the images to be touching each other but it looks like the solution provided on Email on Acid requires a faux-border to be put in. Give the containing TD a style of "font-size: 0px; line-height: 0px;" and follow that with butting the actual <img tags to the open andclose TD's and to eachother.... this will create one massive single line of code, but I've found this is the only way to force Outlook to understand. I have a table that is 650px and the images are 330px and 320px. What do I do if the images need to be side by side with no gap? Wrap the two images in a table and use VML to trick outlook into thing they are cells and not tables. Let me know how it is.